Co-produced by South African producer Anant Singh and the Winesteins, this remake of a very Ring-like Japanese movie Kairo has none other than (original) Nightmare On Elm Street and Screan director Wes Craven in as co-screenwriter. A young woman visits her friend who'd been holed up in his apartment for weeks. He commits suicide in front of her and a dark plot unfolds of a malicious presence lurking inside a wireless signal that overtakes its victims, draining the will to live from them. Web spirits overtake you when viewing a web page with the invitation to come see a ghost. This becomes a deadly epidemic and can only be stopped by the introduction of a virus into the system. 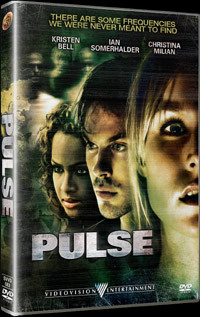 With some effective scenes and creepy moments, Pulse takes what The Ring placed on a video cassette and sends its deadly presence into cyberspace to take over humanity's souls.